"Ye have heard that it hath been said, An eye for an eye, and a tooth for a tooth: But I say unto you, That ye resist not evil: but whosoever shall smite thee on thy right cheek, turn to him the other also" Matthew 5:38-29. The question we must ask about this passage is does the Old Testament law regarding an eye for an eye related to personal revenge, or defending ones family, faith, or homeland from attack? It in fact pertains to personal revenge. This law was an improvement on the usual practice of exacting many times more punishment than the original offense had inflicted on the person offended. Christ raised the bar to the next level, and said that we should not seek personal revenge at all. However, we cannot and should not turn the other cheek when the defenseless are being attacked, because it isn't our cheek to turn. "Learn to do good; Seek justice, Rebuke the oppressor; Defend the fatherless, Plead for the widow (Isaiah 1:17). Usually, oppressors don't respond to kum by ya. More often then not, force, or at least the threat of force is necessary. So do these scriptures contradict the commands of Christ? No, they refer to defending others, not to seeking revenge. It is often asserted that Christ never used or advocated the use of force. This is simply not true. "And when he had made a scourge of small cords, he drove them all out of the temple, and the sheep, and the oxen; and poured out the changers' money, and overthrew the tables" (John 2:15). A scourge is not a bunch of daisies, or a tickle-me-Elmo doll -- It's something used to violently beat other people, so as to inflict pain, in order to violently coerce them in some way or other. Whether He actually struck anyone, or merely threatened to, we are not told, but we do know that the money changers at least believed he would have, and left expeditiously. Saints Boris and Gleb are often cited by Orthodox Pacifists as examples of the way Christians ought to respond to war. After their father, St. Vladimir, reposed, their brother sought to usurp the kingdom, and so plotted to kill Ss. Boris and Gleb. They offered no resistance, because they did not wish to fight their brother, no to see a bloody civil war. However, they were not facing an external enemy who was seeking the destruction or subjugation of their people, but their own brother, and so they chose the path of martyrdom. Their act of personal sacrifice was praise-worthy. 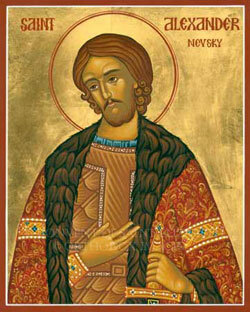 St. Alexander Nevsky faced a completely different situation, and Ss. Boris and Gleb actually played a role in his course of actions. St. Alexander Nevsky faced an invasion from the heterodox Swedes, and so had to defend his people and his Faith. Had St. Alexander Nevsky decided to not resist the Swedes, it would not have been a praiseworthy act, but rather a dereliction of duty. It would not have been a higher path, it would have been a sinful path. So in these saints lives we see the balance between turning the other cheek, and defending one own. St. Alexander's actions were praise-worthy, and Ss. Boris and Gleb's were praise-worthy... and there is no contradiction between them because they all responded to differing situations in complete accordance with the commands of Christ. "My only problem with Moslems is that they want me dead." The report of the Secretary of the Commission on discussions with the Moscow Patriarchate, Protopriest Alexander Lebedeff, on the results of the seventh joint meeting of the Commissions held in late June of this year. To take into consideration the report of Protopriest Alexander Lebedeff. On the basis of the decision of the Council of Bishops of May 15-19, 2006, to confirm and approve the “Act on Canonical Communion” in its revised form as prepared by the church Commissions at the seventh joint meeting, along with other materials developed by the Commissions. In accordance with the directions of the Council of Bishops of 2006, to instruct the Commission on discussions with the Moscow Patriarchate, jointly with the Commission on dialog with the Russian Orthodox Church Outside of Russia, to work out the details of the ceremony of the signing of the “Act” and the Rite of establishment of canonical communion of both parts of the Russian Orthodox Church. Also, in accordance with the decision of the Council of Bishops, to authorize Archbishop Mark of Berlin and Germany, Chairman of the Commission on discussions with the Moscow Patriarchate, to coordinate together with Archbishop Innokenty of Korsun the simultaneous publication of the “Act” which has been confirmed by both Holy Synods on the official websites of the two parts of the Russian Orthodox Church. To consider at the next expanded session of the Synod of Bishops, to be scheduled at the time of the feast day of the Kursk-Root Icon of the Mother of God this year, on the proposals prepared by the joint Commissions at their next meeting. To inform the flock through a special Address on the present state of the negotiation process and the proposed plans for the future. See the original (in Russian) here. Dear in the Lord Fathers, Brothers and Sisters! For 90 years now, the dioceses of the Russian Orthodox Church Outside of Russia have existed on all continents, along with monasteries, publishing houses and parishes. Everything that signifies church life: parish councils, sisterhoods, schools, youth groups, general parish meetings, magnificent choirs, altar boys, etc. gathered around them. All this arose as diocesan conferences and Church Councils convened, which regulated all of church life. Thus, through the chaos of the persecution of the Russian Church, the Russian Orthodox people gathered to stand around their Hierarchy, which found itself abroad, and strove to serve towards the emancipation and rebirth of their people on the foundation of the Orthodox Faith. Within the boundaries of Russia, persecution took the form of the absolute destruction of faith in Christ. Much was destroyed, many suffered. But the Lord did not permit the disappearance of the Church in our Homeland. In those places where ancient churches survived, people are once again gaining spiritual nourishment. That which was destroyed is being rebuilt. Church life is rising from the ashes. Archpastors, clergymen and believers are trying to rebuild Orthodox Russia anew. This process of renascence requires effort and the strength of will, since it is necessary to conduct spiritual educational work with the descendants of the generations of godless violence which touched absolutely every person without exception. Many obstacles remain on this path, but we see that these obstacles, and the remnants of Soviet times, are gradually being overcome. The day has arrived when we must seek the reestablishment of communion with the wellspring of our own traditions. For there are two wills at work—one being that of those Russians who are children of the Russian Orthodox Church Outside of Russia, prepared in every way to cooperate in the reestablishment of church life and development of the spirituality of the people, and the other is from our brethren and sisters in Russia, who labor towards her rebirth and extend their hand to us. Positive changes in the church life of our Homeland spurred the Council of Bishops of October 2000 to establish a Committee on the unity of the Russian Church and to bless the organization of scholarly conferences on church history with the participation of the members of our Church and representatives of the Church in Russia. These conferences were held in 2001 and 2002. Then, in December 2003, a Commission on discussions with the Moscow Patriarchate was formed. At the same time, the Holy Synod of the Moscow Patriarchate decided to create a similar Commission on dialog with our Church. This bore witness to the earnest and good-willed effort of both parts of the Russian Orthodox Church to make sense of the tragedy of our common history, so that we "may discuss peacefully… whatever question there is which separates your communion from us," as we read in Canon 92 (103) of the Council of Carthage, which called upon the flock to trust their Hierarchy, which possessed the right to heal the divisions between the Orthodox and the Donatists. The "Regulations of the Russian Orthodox Church Outside of Russia," the by-laws under which our Church lives, demand that we regularize the situation of the Local Russian Church. It is important to note that a commission to revise the "Regulations of the Russian Orthodox Church Outside of Russia" was established before the year 2000. This shows that even then it was apparent that our "Regulations" are in need of amendment. Since 2000, new possibilities emerged in this regard. Now, in connection with the adoption of the "Act on Canonical Communion," our by-laws can be reexamined, taking into account new possibilities. Still, it is necessary to point out that we are not discussing the "self-abolishment" of the Russian Orthodox Church Outside of Russia. Our Church will exist as before, as attested to by the first paragraph of the "Act on Canonical Communion:" "The Russian Orthodox Church Outside of Russia, conducting its salvific service in the dioceses, parishes, monasteries, brotherhoods and other ecclesiastical bodies that took shape through history, remains an indissoluble part of the Local Russian Orthodox Church." These words in the "Act" attest to the recognition on the part of the Moscow Patriarchate of our historical path and of the living bond between the entire Local Russian Orthodox Church and its part abroad, which always existed and which we never denied. This historical document will reestablish the unity of the Russian Orthodox Church, through this mutual act acknowledging the lawful status of the Russian Church Abroad and the Moscow Patriarchate in Russia. Each side, preserving its identity as a Church, will continue to exist in full legality and independence, but now recognizing the other side and declaring the unity of the Russian Church. For this reason, this means the reconciliation and mutual recognition of each other while yet preserving our administrative self-governance, for we understand the needs of our clergy and of our flock better than they understand them in Moscow. The IV All-Diaspora Council and the Council of Bishops that followed approved the steps towards reestablishing unity already taken by our Hierarchy, and blessed its continued progress. The above-mentioned "Act" has been approved and confirmed by the Synod of Bishops, but it will be finally adopted when it is signed by the Primates of the two parts of the Russian Orthodox Church. Working out the details of this signing, and also the Rite of the establishment of canonical communion has been assigned to the Commission on discussions with the Moscow Patriarchate. It is expected that it will embark on this task jointly with the Commission on dialog with the Russian Orthodox Church Outside of Russia at their next meeting. Then, the results of this meeting will be considered at the next session of the Synod of Bishops, which will be held in December of this year. Dear in the Lord fathers, brothers and sisters! We do not intend to depart from our positions of principle, in particular with regard to the ecumenical movement. We intend to continue to firmly speak out in condemnation of the so-called "branch theory" and of joint prayer with heretics, which is emphasized in our anathema of ecumenism adopted by the Council of Bishops of 1983. This is reflected in the documents of the church Commissions confirmed by both Holy Synods and published in the official publications of the two parts of the Russian Orthodox Church. From this we see that in the Moscow Patriarchate, our attitude towards the heresy of ecumenism has long ago been absorbed. That is why we are not compromising the inherited principles which have always guided us. Still, we were always open to dialog with everyone, but on the condition that this be done without any hindrance to Orthodox teaching. In the decisions of the Councils of Bishops we always held fast to the ecclesiology of moderation, and never rejected the presence of grace in the Moscow Patriarchate or in other Local Churches. We will continue to maintain the spirit of our great fathers, the founders of the Russian Orthodox Church Outside of Russia, following their legacy and the historical path of our Church. To carry this great inheritance to Russia is the mission we strive to fulfill. We will always remember that only in the Kingdom of Heaven will everything be perfect and good, that in the Church on earth we will perpetually experience difficulties caused by human passions, failings, temptations and sins, which must be overcome by means of beneficial fraternal dialog and cooperation, condescension, understanding and a Christian attitude towards each other, as Apostle Paul wrote to the Galatians: "correct such a one in the spirit of meekness" (Galatians 6:1). In conclusion, let us remember Schema-Archimandrite Amvrossy (Kurganov) of blessed memory, the Abbot of Vvedensky Milkovo Monastery in Serbia, whence came several bishops of the Russian Orthodox Church Outside of Russia, since departed. The eminent church figure of the Russian diaspora, P.S. Lopukhin, writing on the Christian death of Fr Amvrossy, said: "I preserve in my memory this image of a man, weeping in joy on his death bed for Divine unity." Blessed Metropolitan Anthony said of Fr Amvrossy that in spirit he was closer to him than anyone. May God grant all of us to experience this feeling of "spiritual joy in Divine unity," leading us to the successful conclusion of the process of reconciliation of the two parts of the Russian Orthodox Church. May the Lord help us! Amen. I worked for what was the Texas Department of Human Services (TDHS) until relatively recently (now it is the Texas Health and Human Services Commission (HHSC)) for 13 years... the last five of which I was a supervisor. 3) The Meltdown of the Colorado Welfare System, and what it should have taught us about the Meltdown in Texas. I left this agency after 13 years, not because I didn't like the people I worked with, or dealing with the people who needed the services it provided. I simply reached a point where I would no longer be a part of the destruction of that agency, and pretend that I could continue to serve the people I had been serving given the increasingly impossible situation that privatization was creating. On the one hand, staff have to deal with the ongoing down-sizing of permanent (and well trained) staff, without any decrease in workload; and on the other hand staff had to deal with the promise that most of them would be out of work within a year... which made the staffing problem even worse. We had to deal with long hiring freezes in the past, as well as high stress levels; but unlike the past, this time around, the only thing we had to look forward to is busting our chops for the next year or so, and then eventually getting a position at reduced pay… if we got one at all. Given those realities, I decided it was best to create my own options, and find other means to support my family. This wouldn’t have bothered me so much if this was happening because the state had decided to cut welfare programs, and so fewer staff were needed to do the work. It also would not have bothered me so much if I thought that the new system would work, and save the state money. However, I am firmly convinced that this new system will be a boondoggle of historical proportions when all is said and done (and this only becomes clearer as the months go by). I am also convinced that the day will come that the state will have to rebuild the agency that they are now dismantling… but at a huge cost, because they will have lost all the infrastructure that they had both in terms of facilities and equipment, and in terms of experienced staff who knew how to get the work done. This is bad business for the state, and a shameful way to treat staff that have maintained one of the most cost efficient state welfare agencies in the United States. When I was still working for HHSC, I suppose some might have thought my complaints were due only to selfish concerns, but now that I haven't had a personal financial interest in the matter for over a year, I hope those who think so will reconsider what I have been saying. I believe time will prove me right... in fact, I believe that the past year has steadily been proving me right, but another year or two will remove all doubts for anyone who is willing to be swayed by evidence or reason.